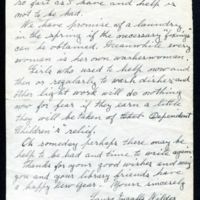 Letter from Laura Ingalls Wilder to Winfield, Kansas children's librarian Helen Crawford regarding household chores and having no time to write. 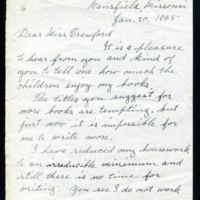 Wilder, Laura Ingalls, “1945 January 20 : letter to Helen Crawford,” Digital Winfield, accessed April 21, 2019, https://winfield.digitalsckls.info/item/6. It is a pleasure to hear from you and kind of you to tell me how much the children enjoy my books. The titles you suggest for more books are tempting, but just now it is impossible for me to write more. so fast as I have and help is not to be had. We have promise of a laundry in the spring if the necessary "fixings" can be obtained. Meanwhile every woman is her own washerwoman. Girls who used to help now and then or regularly to wash dishes and other light work will do nothing now for fear if they earn a little they will be taken of [sic] Dependent Children's" relief. Oh someday perhaps there may be help to be had and time to write again. Thanks for your good wishes and may you and your library friends have a happy New Year.